Memories will come flooding back for Raymond Russell when he watches this week’s Open Championship – and no wonder. It was at Birkdale, after all, where the Lothians man produced a brilliant performance to finish joint-fourth behind Mark O’Meara in the 1998 event. In only his second appearance in the event, Russell followed opening rounds of 68-73-75 with a sensational closing effort of 66, the joint-best of the day with Tiger Woods. 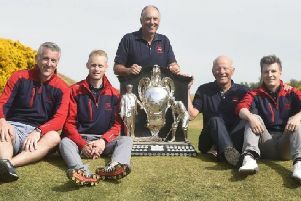 “It doesn’t feel that long ago, but I suppose it shows I’m getting old,” said Russell, who hails from Prestonpans and played all his amateur golf at Longniddry. “If my memory is correct, I think I was tying for the lead after nine holes on the first day or very close to it, but what I do really remember is being on the 11th tee on the Sunday. Among those out watching Russell in the final round was former Hibs chairman Tom O’Malley, who had followed him throughout his career. “I felt very calm all week and that continued all the way through the last round,” recalled Russell, who is now based in the Home Counties and works as a talent-spotter for Nike. “A couple of things I remember are getting a good bounce off a banking at the par-3 12th to about 12 to 15 feet and hitting a great putt that I still don’t know how it didn’t go in. Russell had been hoping to be back at Birkdale with his clubs this week but fell at the final qualifying stage after earlier coming through one of the regional events.